» Articles » Flowers » Roses, Roses, Roses! The flower gardener’s all-time favorite and the classic symbol of love and beauty, roses are not really that difficult to grow in your home garden. A few basic rules of planting, pruning, regular maintenance, and guarding against insect and disease problems will help you produce beautiful blooming roses from early summer up until frost. Step one is to choose the right location for planting; the most important consideration being to pick a spot that receives plenty of sunshine and, certainly, morning sunshine. Rose bushes will grow, but they just won’t flower properly in the absence of at least 6 to 8 hours of daily sunshine. After you decide where you will plant, you must then decide exactly what you will plant. Roses come in a variety of types and sizes. Knowing what these are and which ones are desirable for your gardening purposes will help you purchase wisely and plant correctly. Climbing roses are popular if you don’t mind training them and tying them up onto a trellis, fence, or wall to give them support; otherwise, they will produce long leggy shoots that will fall over onto the surrounding ground and be difficult to manage. Climbing roses often produce many blooms in clusters. However, the blooms are generally small and sometimes flat, consisting of just a circular arrangement of petals. The climbers can best be used as a backdrop in your flower garden, providing lush greenery and blossoms that compliment lower-growing flowers of other colors, shapes, forms, and sizes. 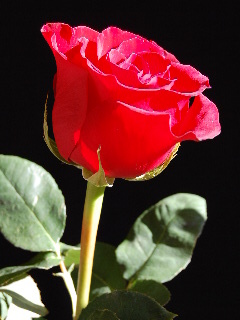 The hybrid tea rose is the classic flower most people visualize when the word “rose” is mentioned. These grow on long stems and the buds are full and thick, being composed of several layers of petals that open to reveal the beauty and fullness of the blossom. The hybrid tea rose is the variety most frequently grown and sold commercially for bouquets and for delivery by florists on Valentines Day and other occasions. 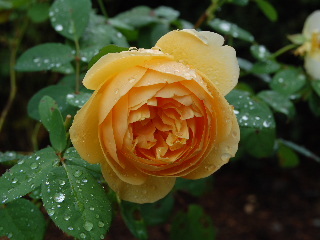 The hybrid teas can also be grown by the home gardener, although they are a bit temperamental in their requirements and are subject to insect and disease problems that must be addressed in order to produce beautiful blooms. Avoid getting water on the foliage when you are irrigating the plants, as this can lead to mildew. Place Japanese beetle traps in your rose garden to avoid having your roses eaten by these pests. Watch for problems and address them with fungicides and pesticides before they get out of hand. Some systemic products are available which feed the plants through the roots and help control diseases and pests at the same time. Besides the climbers and the hybrid teas, other varieties of roses to consider planting might be some of the older varieties, which may be less showy than the elegant hybrid tea roses but more hardy and less susceptible to disease and insect problems. Several varieties of miniature roses are also available for your garden or for use as container plants on your patio or porch. As the colder weather approaches at the end of the growing season, it’s a good idea to cut your rose bushes back to a height of about 12 to 15 inches to prepare them for over-wintering. If you live in an area where winter temperatures are often below the freezing mark, it’s best to surround the base of your rose plants with loose soil. You can then build a small retainer of chicken-wire fencing or felt roofing paper around each plant and fill these containers with leaves or mulch to protect the roots of the plants from the harsh winter weather. As early spring days bring warmer temperatures, remove the covering from the roses in preparation for the summer growing season. To, summarize: be sure you plant your roses in a sunny location, know which varieties you are planting, be pro-active in guarding against disease and insect problems, and most importantly of all………enjoy your beautiful roses!